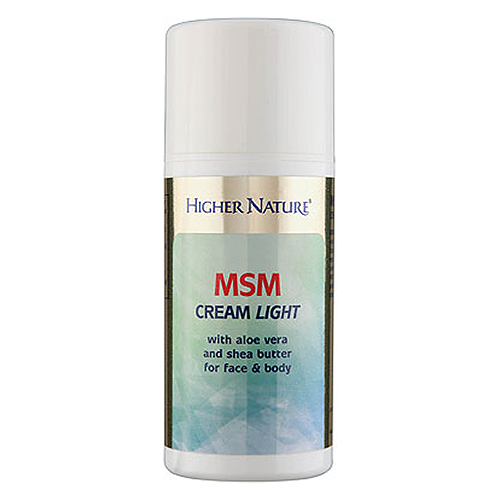 Higher Nature MSM Cream Light is a lovely silky 10% MSM cream is made with Shea butter, Sweet Almond oil, Aloe vera, Helianthus seed oil and a new emulsifier made from Olives to feed the skin. It’s a light silky cream perfect for daily use on both face and body leaving skin feeling soft, smooth and supple. Safe and suitable for most skin types, including ‘problem’ skin. Especially suitable for problem skin and dry areas. Aqua, dimethyl sulfone (MSM), Aloe barbadensis (aloe vera) leaf juice, glycerine, glyceryl stearate, Helianthus annuus (sunfl ower) seed oil, Butyrospermum parkii (shea butter), Prunus amygdalus dulcis (sweet almond) oil, cetearyl olivate, sorbitan olivate, tocopherol (vitamin E), panthenol (provitamin B5), sclerotium gum, citric acid, allantoin, potassium sorbate, retinyl palmitate (vitamin A). Aloe vera, 10% MSM, Sunflower seed oil, Shea butter, Sweet almond oil, cetearyl olivate, sorbitan olivate, Vitamin E, Panthenol, Allantoin, Vitamin A. Below are reviews of MSM Cream Light - Body and Face - 150ml by bodykind customers. If you have tried this product we'd love to hear what you think so please leave a review. 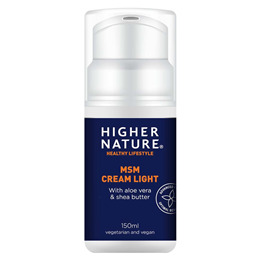 Higher Nature MSM Cream Light is a lovely silky 10% MSM cream is made with Shea butter, Sweet Almond oil, Aloe vera, Helianthus seed oil and a new emulsifier made from Olives to feed the skin. Especially suitable for problem skin and dry areas.